Lately, I’ve been thinking a lot about zebras. The zebra has become the international symbol for neuroendocrine cancer (NET) with patients often wearing zebra outfits and paraphernalia. The reason for this is because physicians are told during their training, “When you hear hoof beats, think horses, not zebras.” In other words, doctors are taught to focus on the more common diagnoses instead of the rare causes. Think zebra has become the mantra of the NET community. Not only is the zebra a representation of the rare disease status of NET, the fact that each zebra has a unique pattern of stripes also speaks to the uniqueness of each NET patient’s disease and journey. One zebra is beautiful...A herd of zebras is a sight to behold. If you’ve ever seen a zebra, you know that the true magic of their stripes happens when zebras gather in a large group. In a herd, the pattern of each zebra’s stripes blends with those of the surrounding zebras. Predators such as lions see a large, moving, striped mass rather than individual zebras. This confuses the lion and as a result, it keeps the zebras safe from the herd. Zebras do better in a herd! Order a NET Cancer Day T-shirt on Saturday! November 10th is the chance for you to gather with your herd. NOVEMBER 10th is NET CANCER DAY! What is NET CANCER DAY? NET CANCER DAY is an annual international event dedicated to raising awareness of neuroendocrine tumor (NET). NET CANCER DAY is a day for YOU. If you or your loved one are affected by NET cancer, it is a day to bring information and hope to you. It is a day for your voice to be heard by raising awareness to this rare disease. The ultimate goal is to improve diagnosis and care of those living with NET. Read more about why a Worldwide NET Cancer Awareness Day affects you HERE. 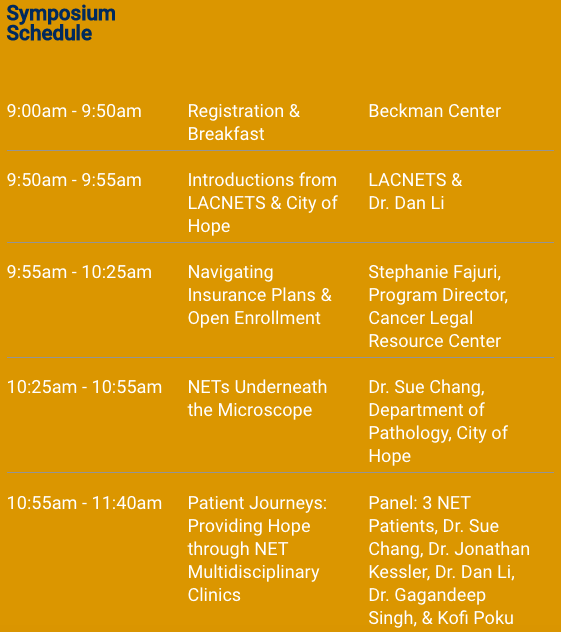 What is the LACNETS NET CANCER DAY Symposium? Our goal for the 2018 NET Cancer Day is to provide information about supportive services for NET program. Not able to join the Symposium in person? Tune in LIVE on Saturday, November 10th from 9:50am to 11:30am PST! To learn more about NET, click here or here. What can I do to raise awareness of NET Cancer? Talk: Share your story with friends, family, acquaintances, healthcare providers, and on social media. Walk: Come to the LACNETS Symposium on November 10th. Hope! Always hold onto hope!